Brrrrrr - technically we have 10 more days to go before the beginning of winter! I think Mother Nature is jumping the gun this season! The best part of the cold weather - comfort food! You know, the kind of food that makes you feel all warm and cozy, harkens you back to yesteryears. What's cooking - Stout Braised Short Ribs. Best of all - it's crock pot friendly, yet impressive enough to serve up to the most discriminating guests, or an everyday dinner. 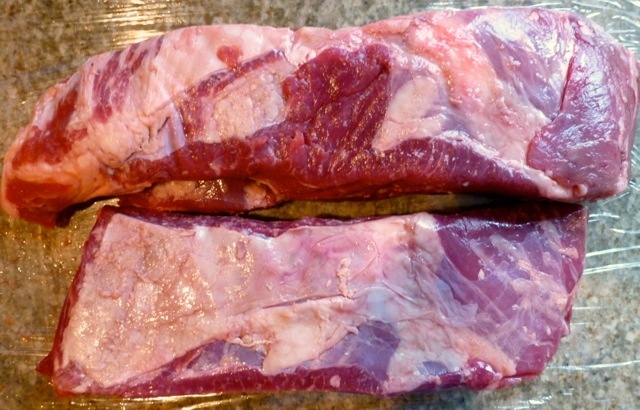 What are short ribs? They are meaty cuts of beef cut from the rib section; and they are perfect for long, slow, moist cooking. I picked up these beauties from Axel at Lindenhof Farm - they are super meaty! This recipe is from Williams Sonoma - it's become a standard in the farmers market kitchen. You'll need to brown the ribs first - the browning process really helps to give the dish a deep rich flavor. Some of the newer slow cookers on the market actually have a browning function to make this step easier. I browned my ribs in a saute pan. After browning the ribs, saute the veggies in the same pan. 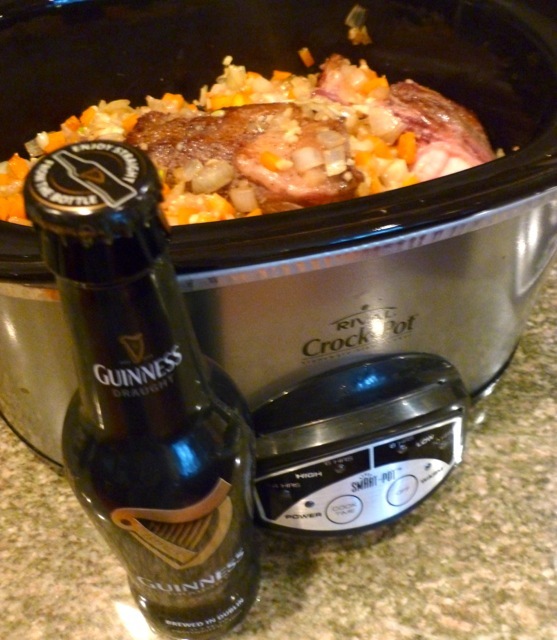 Transfer the ribs and sautéed veggies to the slow cooker, add the stout. I used Guinness because it was handy - try a good local beer if you can - Victory! Set the slow cooker to a 6 hour cook and enjoy as your home fills with the heady aromas of the braising beef. Try not to lift the lid, especially during the first half of the cooking process. Since slow cookers cook at such low temperatures, any escape of heat from lifting the lid can really effect the cooking time. When the cooking is completed, carefully lift the ribs from the slow cooker, trying not to let them fall apart. The sauce is made by pureeing the liquid and veggies together. Season the sauce to taste with salt and pepper. Ahhh, the ribs are tender beyond tender, and the gravy is rich and flavorful. The meat falls off the bone. I always make mashed potatoes with celery root as a side dish - the gravy on the potatoes is amazing. Add a seasonal veggie as a side dish, and you are done! If this doesn't warm you up - nothing will! To drink - stout of course. FYI - I've actually made this same short rib recipe substituting Frecon Farms Hard Cider in place of the stout, and it was over the top fantastic!